Designed especially for the laboratory these kits offer a diverse economical way of acquiring flow measurement capabilities. Since all 150 mm flow tubes in our catalog are interchangeable, additional flow tubes may be added later. A handy selection of flow meters is presented in kit form. Kits are shipped in convenient molded plastic carrying cases. Flow tubes and floats are interchangeable in frames supplied facilitating overlapping flow ranges. For non-corrosive fluids use the Aluminum Kit. 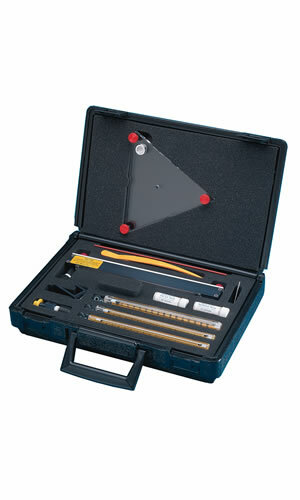 For corrosives consider the Stainless Steel Kit. For corrosive applications at lower pressure or for high purity fluid service specify the PTFE Kit. All three models offered are supplied with glass floats installed. Aluminum and Stainless Steel kits come with spare stainless steel and tantalum interchangeable floats to extend flow capacities. Due to chemical compatibility considerations PTFE kits are supplied with spare sapphire floats. Assembled with 042-15-GL flowtube. Extra flow tubes as listed in above table. Stainless steel float for 042, 112 and 102 flow tubes. Tantalum float for 044 flow tube. High flow valve cartridge. Tripod base, tweezers, pushrod and locking tool for changing floats and flow tubes. Calibration data and carrying case. Wetted parts are borosilcate glass, aluminum, 316 stainless steel. Buna-N o-rings and Viton® packings. Wetted parts are borosilcate glass, aluminum, 316 stainless steel. Viton® o-rings and packings. Assembled with 042-15-GL flowtube. Extra flow tubes as listed in above table. Sapphire floats. High flow valve cartridge. Tripod base, tweezers, pushrod and locking tool for changing floats and flow tubes. Calibration data and carrying case. Wetted parts are borosilcate glass, PTFE and PCTFE.